i got No targets found. Be American, buy American! I do my best to buy things that are Made in the USA - and I don't buy much. I did, however, buy a Ford Focus a few years ago. Great car! Just terrible! Why do they want to drive workers destitute? Also "no target found" probably due to our colonial status or whatever. Signed & noted. Thanks, Dandelion. Noted, signed--thanks Dandelion. Buy "Made In The USA", or locally, as much as we can. No targets found. It won't let me sign. Noted. noted & signed; Thank you Dandelion! I had my doubts about this petition when it didn't tell us to whom the petitions would be delivered---congressmen, railroad builders/corporations? When I signed, the page came back with "target not found" message. I think that means it's not going anywhere, doesn't it? Well, good try anyway! The subject matter is important. 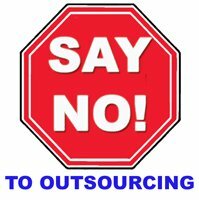 We should be demanding that much more outsourcing should be stopped. Corporations are getting away with paying pennies on the dollar for foreign workers while hiding their profits in the Caymans. How patriotic of them! Don't Outsource Our Rail Infrastructure! As Caitlin stated, no tags showed and I am also wondering to who, what, and where this is going? Signed anyway. Or it could be just for the people of Florida. I know Gina, so much for this Republican run State keeping jobs in Florida.